I attended the annual grading of the BJJ school where I've trained for the past five years at the weekend. 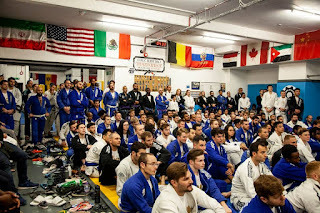 There was never any chance of me changing my belt, so I was mainly going to catch up with a few people and support my fellow training partners after a while away from the mats because of injury. It was a good day, which started with the kids getting their new belts and stripes. This remains one of the cutest things I see all year. Then it was the turn of the adults and a few of my regular training partners got promoted. This was good for several reasons. Firstly, it was a stark reminder that if you want to progress then you have to put the work in. You have to take responsibility for your own progress and everyone who got a new belt had grafted. They'd also been consistent in their attendance. Another key requirement. These are factors I'm currently relearning in all my martial arts training post-injury and post-work-nightmare. Routine, consistency and determination equals success. Eventually. Even for somebody who's as unlikely a martial artist as me. Finally, it's just good to support your mat family. I was utterly hopeless when I started BJJ. For a very long time. Harsher critics may even say I'm still not that good. And, even though my teachers are excellent, one of the major factors in me becoming less useless has been the support and advice of my fellow students. So it's good to cheer and celebrate their successes. Sadly, with me no longer working in London, I may have to find a new BJJ club to train at next year because the additional expense of travelling into town with no income will make it prohibitively expensive. The priority next year has to be making the writing work and any spare financial resource has to be directed at that goal. If that class exit does happen, though, the lessons learnt at London Fight Factory and emphasised by days like the grading will continue to educate my training. Wherever that may be. But at least I've promised myself that my BJJ training will continue. I've sort of got the bug now. Photo courtesy of Dun Jiujitsu PhotoZ.